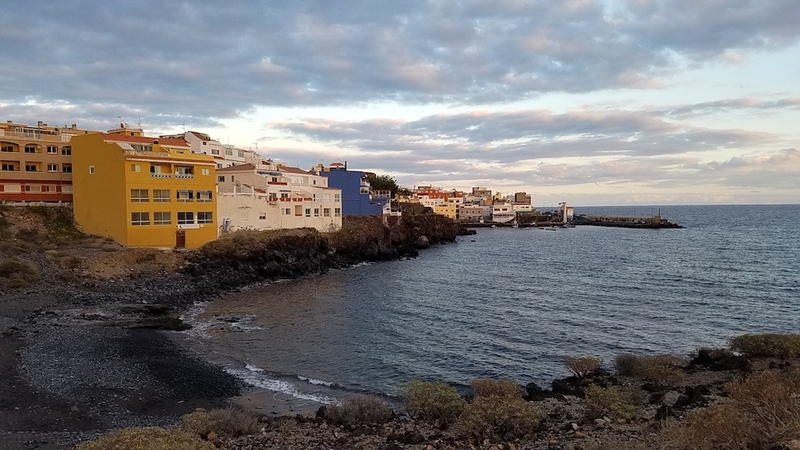 I visited Los Abrigos, Tenerife, Cnaaray Islands, Spain in early 2017 when I did some work with Thomas Airlines. You can read the Trip Report here. It’s a small town basically at the end of the runway in Tenerife with a beautiful beach, great food and people. I enjoyed spending the evening here watching the sunset and the people enjoying the evening walking their dogs, watching planes or just taking a walk. Los Abrigos is located in the Canary Islands, a territory of Spain on the island of Tenerife, off the coat of Morocco in Africa. At the time of this writing, there are no non-stop flights from the U.S. to Tenerife. You must connect via Africa, Europe or the Middle East. The island is served by two airports, the closest to Los Abrigos is the South Airport. It’s pretty easy to take a local bus to the town from the airport and its a great place to plane spot as well. Air Europa (UX), Alitalia (AZ), Binter Canarias (NT), Canaryfly (PM), Finnair (AY), Iberia Airlines (IB), Norwegian Airlines Shuttle (D8), Royal Air Morac (AT), Ryanair (FR) and Vueling (VY). Aer Lingus (EI), Aeroflot (SU), Austrian Airlines (OS), Binter Canarias (NT), British Airways (BA), brussels airlines (SN), Condor (DE), EasyJet Airlines (U2), Eidelweiss Air (WK), Eurowings (EW), Finnair (AY), Germania (ST), Iberia Airlines (IB), Jetairfly (TB), Jet2.com (LS), Lufthansa German Airlines (LH), Luxair (LG), Meridiana Airlines (IG) [now Air Italy], Monarch Airlines (ZB), Neos Air (NO), NIKI (HG), Norwegian Air Shuttle (D8), Norwegian Air Shuttle (DY), Ryanair (FR), Smart Wings (QS), Sun Express Germany (XG), Thomas Cook Airlines Belgium (HQ), Thomas Cook Airlines (MT), Transavia (HV), TUI fly (X3), VIM Airlines (NN), Volotea (V7), Vueling (VY), Wizz Air (W6) and Wow Air (WW). You can find additional information on a post I wrote for Unfamiliar Destinations at http://www.unfamiliardestinations.com/golfdelsurtenerifecanaryislandsspain/. Have you been to this island or this town? Leave a comment below and share with your colleagues as well.